(892200):1 door, manual 22 Gallon 65" X 23.25" X 18". (892220):1 door, self-close 22 Gallon 65" X 23.25" X 18". New Slimline Cabinet adds storage in tight spaces. Justrite Slimline Cabinet turns tight quarters into storage space! Even with a small footprint, this cabinet offers a big advantage when workspace is at a premium. Safety and convenience are built into it's compact design. Double wall, air insulated, welded steel construction offers fire resistance. A three-point, self-latching door on a continuous piano hinge provides smooth, secure closure. Cabinet includes three "spill-catcher" galvanized steel shelves to catch incidental drips and a 2" leakproof sump for spill control. Other extras include dual vents, adjustable leveling feet, a grounding connector, and large trilingual warning label identifying contents. 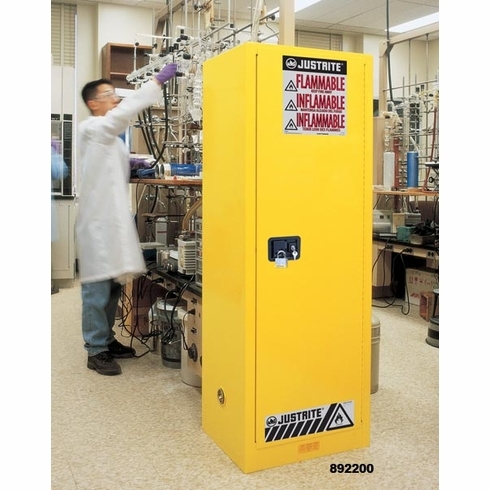 Finished in a chemical resistant powder coat paint, this 22-gallon capacity unit combines durability and safety into a space saving design.